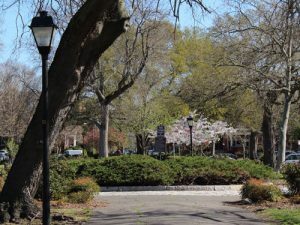 The 2019 Stockley Gardens Fall Spring Festival will be held on May 18th & 19th in Stockley Gardens Park at the corner of Stockley Gardens and Olney Road in Norfolk, VA. Festival hours are 10 a.m. to 5 p.m. on Saturday and noon to 5 pm on Sunday. Hosted by Hope House Foundation, the free two-day community event features 125+ artists, musicians, and food vendors. Stockley Gardens Arts Festival has been named as one of the top two outdoor art festivals in Eastern Virginia by Virginia Living Magazine readers for six years. Artists present works in various media including painting, glass, sculpture, photography, and jewelry. This year’s judge is Lorraine Peltz teaches at the School of the Art Institute of Chicago. Everyone is welcome to the free Art Party sponsored by O’Connor Brewing Company. This fun event recognizes artists awards and features the band the Delirious George on Saturday from 5 to 7 p.m. with a cash bar. There are also activities for children throughout the weekend with clowns, magicians, musicians, and art activities. Stockley Gardens Fall Arts Festival presented by Union Bank & Trust is also sponsored by Capital Group, Miller Oil, Southern Auto Group-GMC, The City of Norfolk, and Ghent Business Association. Media Sponsors include VEER Magazine, Coastal Virginia Magazine, and WHRO. Proceeds from the Stockley Gardens Arts Festivals support the programs of Hope House Foundation, the only organization in Virginia that provides support for people with intellectual and developmental disabilities exclusively in their own homes.